We are creating a 1.5-km trail extension and lookout to provide an enhanced nature experience and improved observation of the wetland by Goodwin Bay. The extension will connect to the main trail and provide access to the central part of the wetland and to several different wetland border and upland habitats on the north side of the property. An observation tower will offer a mid-wetland vantage point for the study of resident and migratory wildfowl and other animal life adjacent to the Ottawa River. We will also build an Osprey nesting tower nearby. The Club built the Macnamara Trail in the late 1990’s, and continues to operate and maintain it through an agreement with Nylene Canada, which owns 280 acres next to their plant on McNab Street. Through Nylene’s generosity and the Club’s diligence, the community has access to the 4.5 kilometre Macnamara Trail on this private property in the Nopiming Crown Game Preserve adjacent to the Ottawa River at Goodwin Bay. The Macnamara Trail lies in the southern portion of the Nylene Canada property with no access to the north side. Located in the suburban southeast side of Arnprior, the Macnamara Trail is used by Arnprior residents and surrounding communities for passive recreation and peaceful appreciation of the natural world. It connects to the town’s Millennium Trail system via the MacLachlin Trail and is adjacent to the McLean Park and McLean ball diamond fields by the Ottawa River. 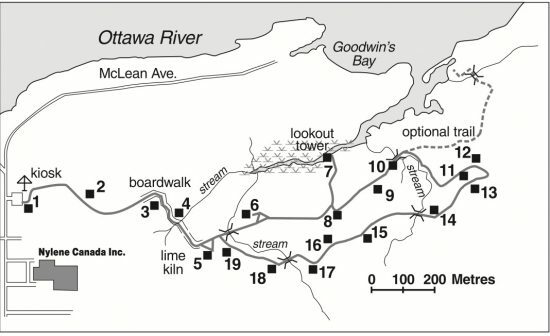 Using the Millennium Trail network, an energetic hiker can walk from the trailhead to enjoy the waterfront views by McLean Park, cross the Madawaska River bridge into downtown Arnprior, visit the library, and explore the old growth trees in Gillies Grove. 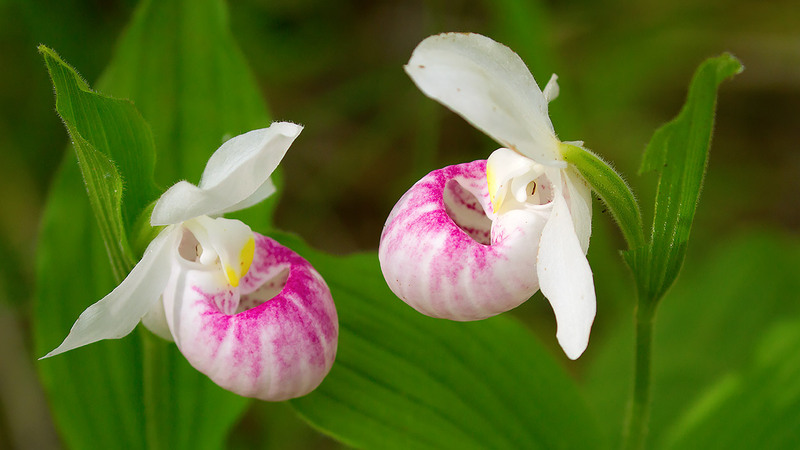 The Macnamara Trail lies in the southern third of the 280 acres, south of the large, central Provincially Significant Wetland. Two-thirds of the property – the wetland and the northern forest – are inaccessible from our current trail. Although the Club built a 3 metre high observation deck on the southern margin of the wetland, sight lines into the wetland are limited and distant from the river. – an attraction for out-of-town visitors and nature clubs. 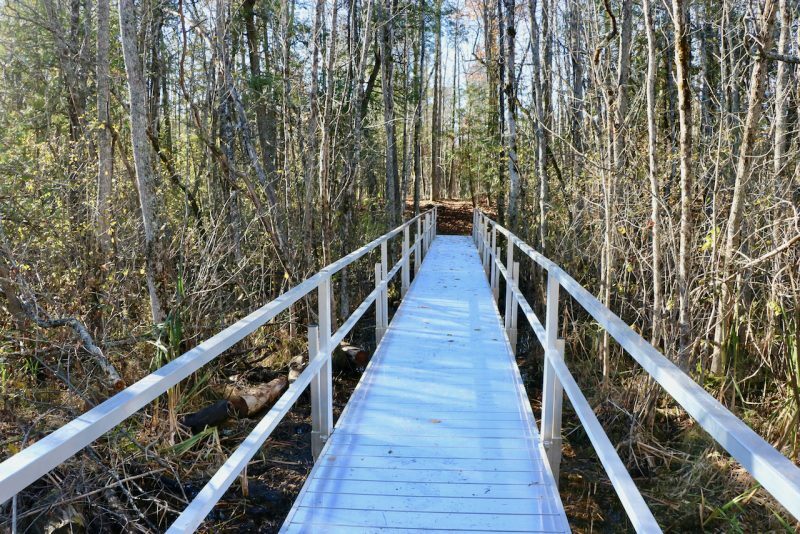 The Trail Extension Project consists of building the West Link, the new Nopiming Loop, the Goodwin Marsh Lookout, an observation deck, and an Osprey nesting platform. – The West Link connects the current trail on the south of the property to the Nopiming Loop in mixed forest on the north of the property. A 220 foot boardwalk was installed in November 2018. – The Nopiming Loop is a 1.5-km trail through woodlands and around marble outcrops and small ponds. It showcases a different forest ecosystem from the existing trail on the south side. Marking the trail and installing signs started in fall 2018 and will finish in the spring of 2019. – The Goodwin Marsh Lookout is a 250-metre one-way trail across a chain of small, rocky islands in the wetland. – The observation deck provides a 360-degree view of the marsh from its vantage point near the middle. – The Osprey nesting platform is located in the marsh about 100 metres from the observation deck and near the Ottawa River. The Osprey is a fish-eating hawk and needs open water to hunt. We are currently evaluating different options for crossing the West Link, taking into account the capital cost, maintenance cost, and the installation challenges. When this is done, we will provide a timeline for the project. Phase 1: Construct the West Link and clear and mark the Nopiming Loop. Status: West Link installed in 2018; trail marked in 2019. Phase 2: Build a boardwalk to cross the first two spans in the island chain. We will evaluate the design over a full year to observe its efficacy. Phase 3: Build a boardwalk to complete the island chain and add the observation deck. What will a walk on the new trail extension be like? Read Imagining a Walk Along the Future Macnamara Trail Extension to help you visualize your trail experience. We continue to fundraise for this significant and ambitious project, which will be paid for with a combination of donations from businesses and the community, club funds, and money from grants. 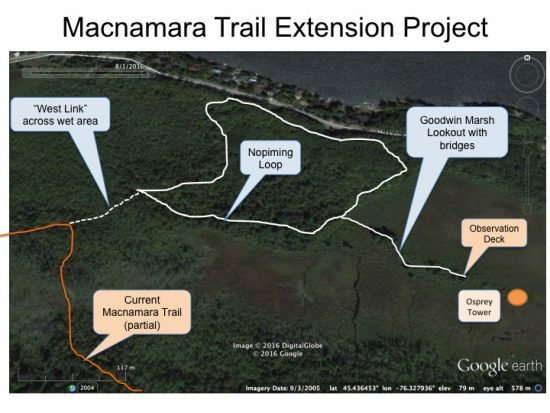 You can Donate directly to the Macnamara Trail Extension here. Note: PAYPAL is the gateway through which you can choose to pay either by your PAYPAL account OR by credit card, according to your preference. Tax receipts will be mailed for Trail Donations of $20 and more. If you’d like to join the Fundraising Committee or just help out at events, please contact us at trail@mfnc.ca . The Club gratefully acknowledges the support of the following companies and individuals for generously contributing to the success of this project.